Food Blogging made me to explore many international recipes across the world. I have tried few recipes based on the food I tasted while going out with my hubby. I came across some international recipes through my fellow bloggers. Few months ago when I was in abroad, my husband was telling me about Thai food especially the tom yum soup which he loved it most. I wanted to try it at home for him and searched for the recipe over web. But instead I landed here for the Thai red curry. While going through it, I found the preparation to be easy. I can't describe the feeling when you find some good recipes which can be prepared without the need to shop extensively. Yes, to prepare this recipe, I had all the ingredients except lemon grass and Galangal. So the next day, I bought these ingredients from the nearby shop and prepared it for lunch. 1) In a wide pan / kadai, heat oil. 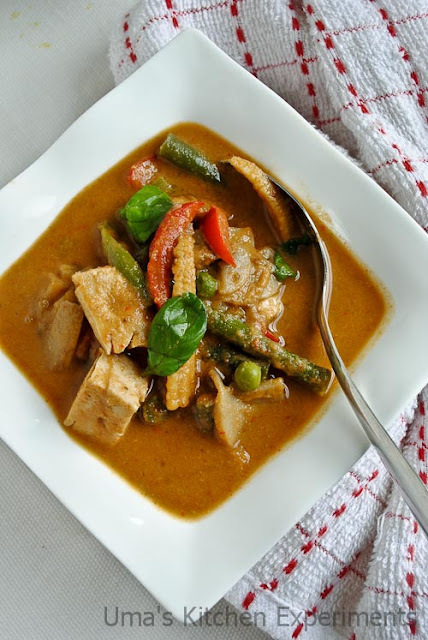 2) Add the red curry paste when it is hot, saute till it releases oil in sides. 3) Add the coconut milk now. Mix well till the red curry paste blended with it. 4) Add the soy sauce, sugar and salt. 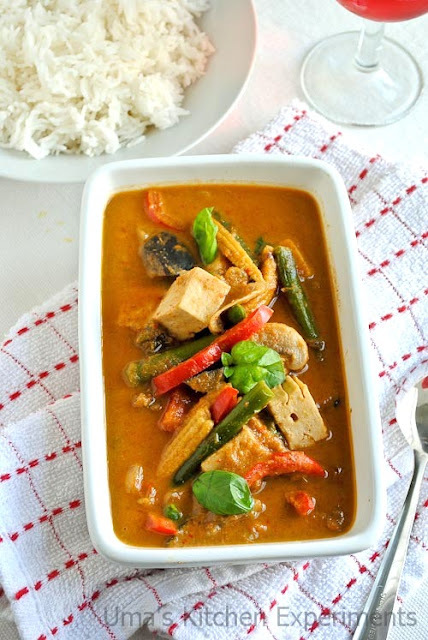 5) Add the vegetables and tofu given under ingredients to this gravy and cook till it becomes soft and at the same time retains its shape. 6) Add mushrooms now and mix gently. 7) Add 3 torn basil leaves and continue cooking for 5 minutes. 8) Taste and adjust the salt. When all the vegetables are cooked enough (also they should be firm), Turn the flame off and garnish with remaining basil leaves. 9) Serve hot. We enjoyed it with hot steamed rice. 1) Use any vegetable which are available in your kitchen. 2) I used canned coconut milk. You can also prepare coconut milk out of coconut powder or by fine grinding fresh coconut. Curry looks so colorful and very inviting..
this curry sounds very flavorful and delicious...sure lemon grass adds nice flavor and unique taste to thai recipes, especially the spicy noodles! one of my fav curries in Thai restaurants,perfectly done!! 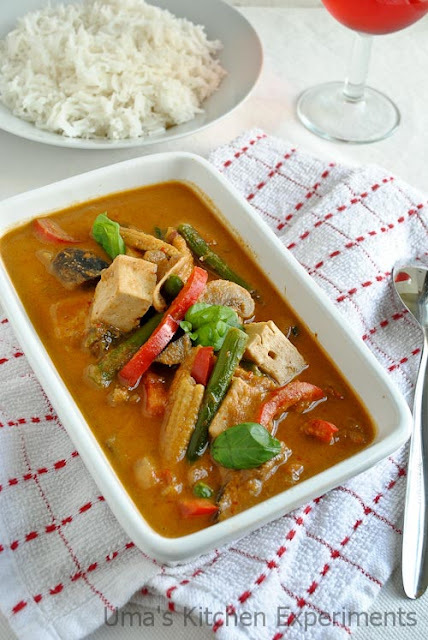 Delicious and mouthwatering curry. Lovely preparation. Stunning pics. This is such an inviting meal, love the garnish of fresh basil on top! Cute and very attractive presentation,love to grab that curry and have it rite now with some rice. awesome presentation uma.. very colorful curry.. 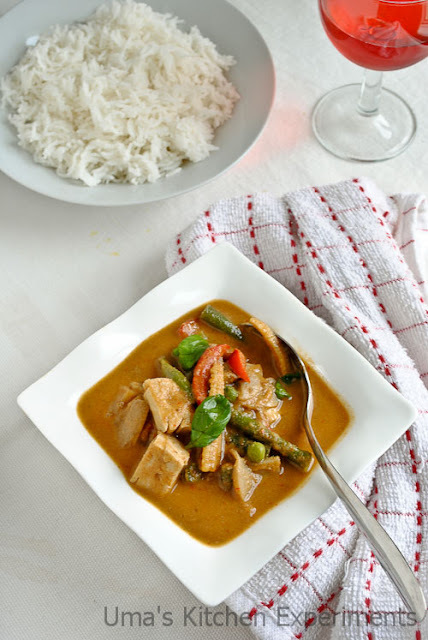 I love thai curry its my fav.I make it twice in a 3 months r something lovely click. super tempting n colourful curry!! This is a beautiful curry dish, I like that it is rich with vegetables. Looks so delicious! I love Thai food.